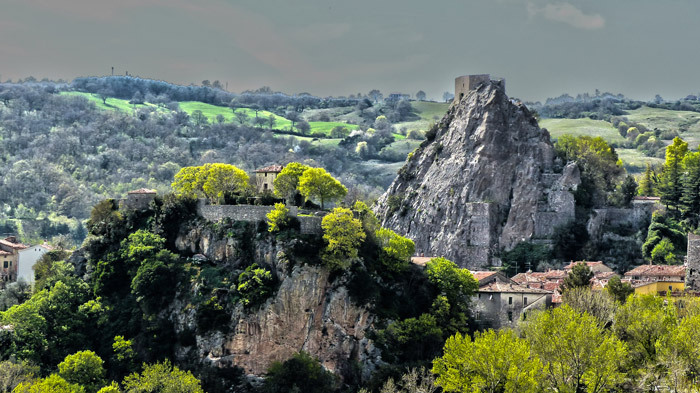 Explore the undiscovered Maremma cities, towns, villages and hamlets in Tuscany and Lazio: hidden treasures steeped in history, legends, & mystery, so well preserved that it takes very little for the imagination to carry you back in time to centuries past. Maremma has three cities: one in each of its ancient constituent parts. The City of Piombino in Maremma Livornese along the Costa degli Etruschi to the north. The city of Grosseto in Maremma Grossetana in the centre. And the city of Civitavecchia at the southern-most point of Maremma Laziale, on the coast of the Province of Roma, in the south. But these days, the majority if you are having a conversation with locals here, most consider Maremma to be continguous with Maremma Grossetana and Grosseto to be Maremma's one and only city. 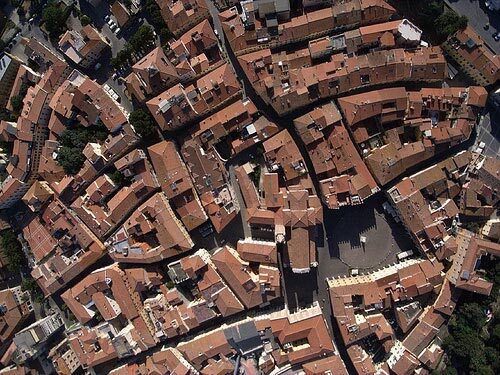 This is Grosseto from the air. And the view from inside its city walls. 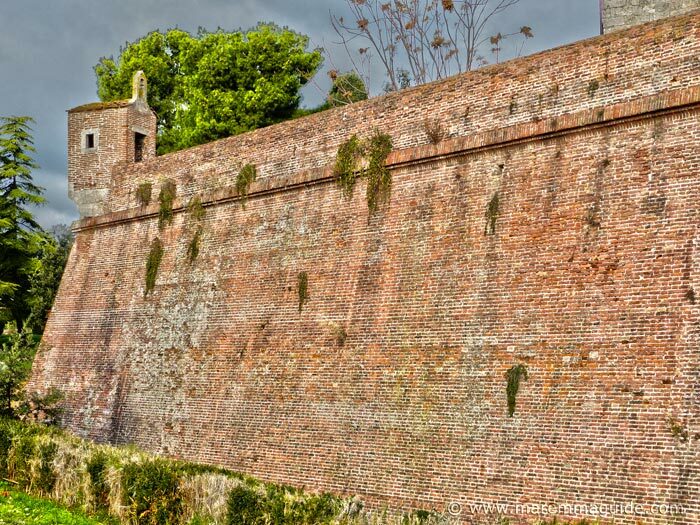 The Medicea family had bastions and a "cassero" (keep) built within the fortified enclosing city walls that had guard look-out posts directed onto their people inside the city. Just in case they were tempted to revolt! It wasn't unheard of! Take a wonderful guided walk through its historic Medicea fortress heart, go shopping Italian-style, and people watch over a coffee in Piazza Dante. Piombino. The steel town from which most people take a ferry trip to the Island of Elba, but rarely explore the city itself. An important Mediterranean port, Civitavecchia is also known as the "Port of Rome" and is home to the impressive Forte Michelangelo, the Rocca castle and pirate ships. Take a trip back in time to medieval Italy in the historic centres of Maremma's hill towns, villages and hamlets. They will have you crouching to pass through tiny passageways not knowing whether to watch your step as you descend their extremely steep and narrow streets, or to look up at the glimpses of magnificent views at their ends. Intensely tranquil places with very little tourist activity, you will be noticed! But always warmly welcomed, whether by the retired men sitting and talking together in the small squares, or by the owner of the only bar in town. Ask for directions and someone will take you there! 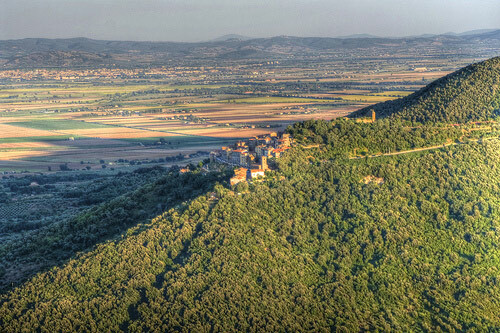 Sat high up on Maremma's metalliferous hills, they offer spectacular panoramic views of the surrounding landscape that will take your breath away. 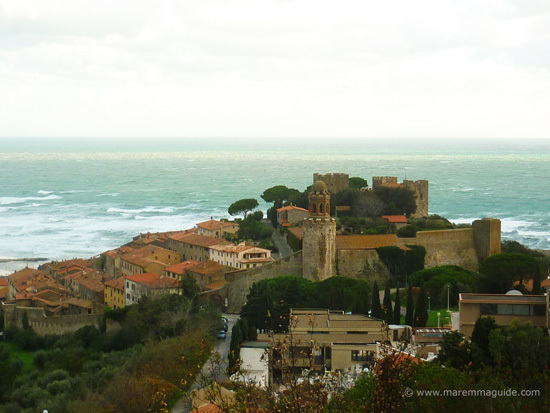 The historic centres of some of Maremma's beach towns are on a hill too, such a the very pretty and popular town of Castiglione della Pescaia, but you will find them here in a page of their own written especially for those of you looking to base yourselves for your vacation in Maremma by the sea. These Maremma towns, villages and hamlets are not located on the top of a hill nor by a beach along the coast, but are still not to be missed. Each one offers a unique taste of everyday life in rural Tuscany. Bolgheri isn't a typical Maremma village: its wine fame has been at the expense of losing its rural character and becoming a tourist destination of souvenir shops and plastic covered multiple language restaurant menus. The best bits are the drive along the famous cypress tree-lined road to reach it and the wine route to Castagneto Carducci. Montioni is a tiny hamlet in which you will find a bar/restaurant and wild boar roaming the nature reserve that takes its name and the car park! It was once a thriving allum mining village and the home of Elisa Bonaparte Baciocchi, the Grand Duchess of Tuscany. The closest hamlet to both the best beach in Italy - Cala Violina - and the gorgeous stretch of golden sands of Capanna Civinini beach, Pian d'Alma makes an ideal stop for picnic supplies and a lunch or dinner stop. Pian di Rocca is a hamlet whose with its own annual sagra food festival and is home to fields upon fields of a very special artichoke - the "Violetto di Toscana" - that Catherine de Medici took with her to the French court when she went to marry the future King Henry II of France. The tiny but once so grand Sovana has lost its raw Maremma charm, but is a history treasure trove nonetheless and home to some exceptional medieval art and the hidden gold treasure of Monte Cristo. It is worth a visit just for the drive through the tufa tunnel to reach it! 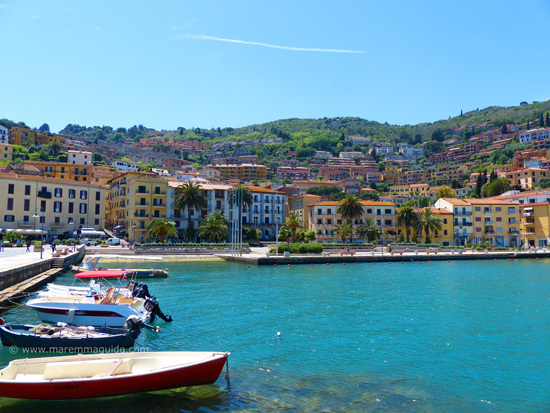 What at first glance might appear to be a bland Italian village, Valpiana was once the centre of the most productive of iron-ore smelting and steel foundries in the whole of the region. It is from here that the Medici family tried, but failed, to create an iron monopoly. 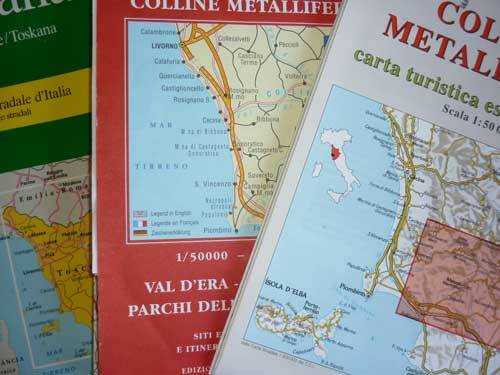 Unsure where to start exploring: take a look at the Maremma map to get you started.